In addition, Germany’s share of the cost of radar development has increased by €585 million compared to the initial estimate, the report states. “The acceptance and delivery of Block 25 aircraft will continue to be delayed due to weaknesses in the demonstration of the new front-end computer revealed in 2017,” the report says. The delays are due to unforeseen difficulties in software development, to a continuing divergence between Germany and the UK on the radar’s principal function, and to the late approval of a new front computer. Furthermore, the “limited availability of [radar] components for production can additionally delay the delivery,” the report says. “According to current industry estimates, the development plan can continue to be adhered to, but now with very high software development risk,” it adds. But Eurofighter’s industrial partners, as well as the Eurofighter consortium itself, say there is no delay and that the program is on schedule. “The Captor-E (E-Scan) radar development programme for Eurofighter Typhoon remains on track, with a number of flights, with the radar both powered and unpowered, having now taken place as part of the scheduled programme of activity,” BAE Systems, Leonardo and Eurofighter GmbH said in a joint April 6 statement in response to our request for comment. Airbus concurred separately. “The Captor-E Radar equipment and Weapons System capability will be incrementally enhanced to enable the required capability (P3E Standard) to be available for the first deliveries to the Kuwait Air Force,” the joint statement added. Eurofighter Jagdflugzeug GmbH, a German company headquartered in Hallbergmoos, near Munich, is the Eurofighter program’s prime contractor and BAE Systems is the British industrial partner as well as the radar purchaser on behalf of Eurofighter GmbH. The aircraft division of Leonardo is the Italian industrial partner for Eurofighter, while its Airborne & Space Systems division is the lead contractor for the Euroradar consortium that is developing the Captor-E AESA radar. A 13-month delivery delay would disrupt Eurofighter deliveries to Kuwait, which is the launch customer for Eurofighter’s Captor-E electronic scanning radar. Deliveries to Kuwait were originally planned to begin in the final quarter of 2019, according to a statement by Kuwait’s ministry of defense, but have already been postponed to late 2020, according to a December 12 press release by Leonardo. The report also reveals that a working group comprising national representatives, industry and the NATO Eurofighter and Tornado Management Agency (NETMA), has been established to reconcile a major divergence within the program: “Whereas Germany’s priority is the improvement of the air to air/air to ground capabilities, the UK's priority is on electronic warfare,” a German defense ministry spokesman said April 4. “However, for both capabilities a multi-channel receiver is needed,” the German MoD spokesman said, and this has still not obtained its airworthiness certificate. “To safeguard German interests with regard to demand, costs and industrial policy consequences, in the short term a possible compromise solution is currently being prepared by a working group,” the report states. “Because of delays in approving the new front-end computer,” the delivery of the first production radar by the end of 2018 seems unlikely. The front computer controls the Utility Control System, and a new version has been introduced for obsolescence reasons. But “If the airworthiness certification of the computer is not granted on time, the new computer cannot be installed, further delaying the program,” the German MoD spokesman said. “The mitigation and possible delays are currently under investigation by industry in close contact with NETMA and the Eurofighter Partner Nations,” the spokesman added, but it has been set no reporting deadline. Despite these continuing delays, initial flight testing of the AESA radar began in March as scheduled, the spokesman said. The radar has been fitted to the program’s IPA 8 test aircraft for these tests. Germany has ordered a total of 143 Eurofighter aircraft in Tranches 1, 2 and 3A and, by the end of 2017, 129 had been delivered. “The technology of the AESA radar with multi-channel receiver will, in future, improve the Eurofighter’s operational capability by allowing simultaneous use of air-to-air and air-to-ground modes. In addition, with the AESA radar the operational added value of modern air-to-air weapons are exploited,” the report states. 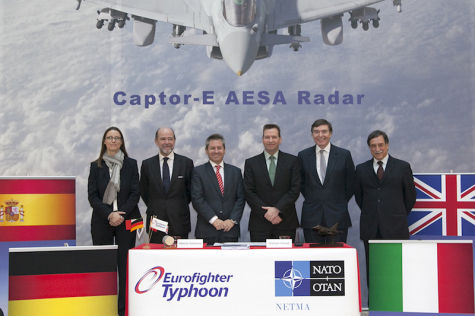 The decision to fit all Eurofighter multiroles (Tranche 2 and 3a aircraft) with AESA radar, including a multi-channel receiver equipment, will also strengthen Germany's position in the four-nation Eurofighter program, the report observes. Finally, the report notes that, since the Eurofighter program was approved by the Bundestag, it has accumulated 149 months of delay, and that its cost to Germany has increased by €6.6 billion over initial estimates.